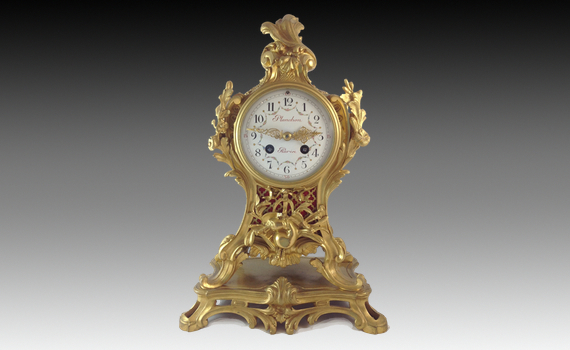 A late 19th century, gilt bronze mantel clock in the Louis XV style. The acanthus cast rococo case of waisted form, retaining the original gilding, cast with central motif of musical instruments, flanked by flowers and scrolls with stepped plinth base. The open fretwork panels with red silk. The circular white enamel dial painted with floral swags and roman numerals, signed under the VI by the enameler ‘Baudet’. The eight day twin train movement with outside count-wheel, striking the hour & half hour on a bell. The movement with Samuel Marti Seal 1889, movement & pendulum stamped 888.